The ski lift ride to the top of the nearby mountain for the breath-taking ceremony location overlooking the mountain scenery, Granby Ranch showcases what Colorado weddings are all about. Granby Ranch offers a bunch of different activities for your guests to enjoy over their stay, including fishing, mountain biking, hiking and golfing. The ranch offers sweeping views of Grand Lake all the way to Winter Park. It's the perfect wedding location that is located west of the Continental Divide. I love capturing outdoor portraits, whether that be couples, families, high school seniors or weddings - and in the case of this wedding photo: shoes! I love photographing wedding details and trying to showcase them in new and creative ways. 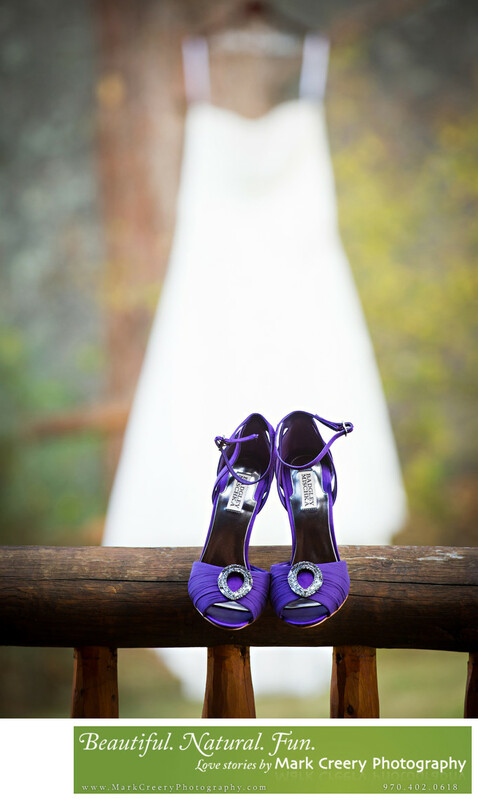 In this photo, I put a pair of Badgley Mischka's on a wooden railing with the bride's wedding dress hanging on a pine tree branch far in the background, which allows the dress to be blurry in the background. This allows me to tell more of a story about the context of the day and what the shoes actually mean. The shoes against the fuzzy white background also 'pop' more to the viewer's eyes. Granby Ranch is located in Granby, Colorado. Contact: groups@granbyranch.com, 970.887.5143. Location: 1000 Village Rd, Granby, CO 80446.